With Indigenous language acquisition comes a worldview that challenges our alienation from the environment. Environmentalism is baked into our languages and philosophies. 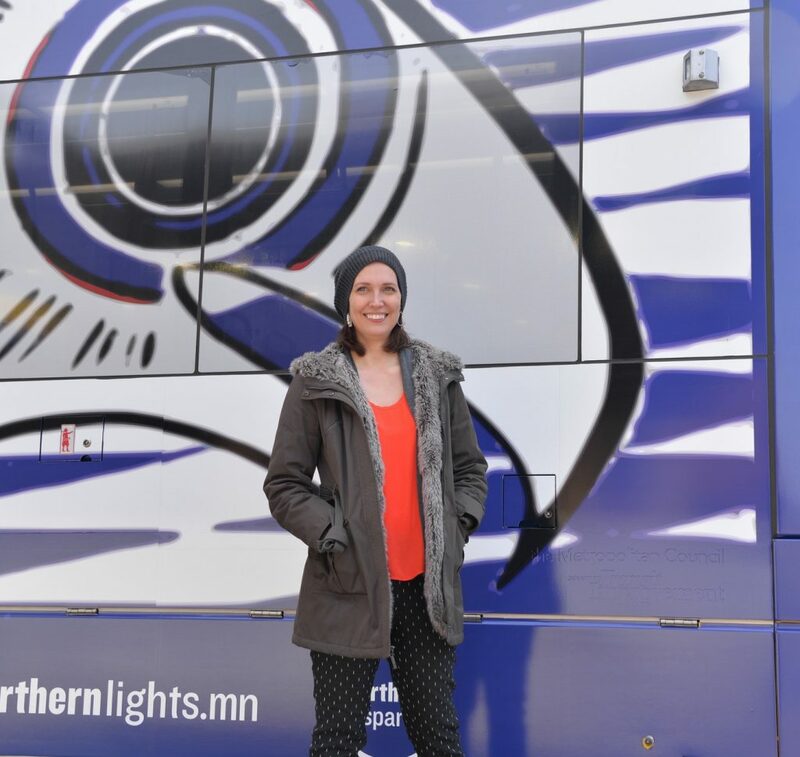 To kick off Northern Spark 2017, Northern Lights.mn and Metro Transit partnered to commission a spectacular full-color train wrap created by artist Andrea Carlson, which will run from March through June 10. 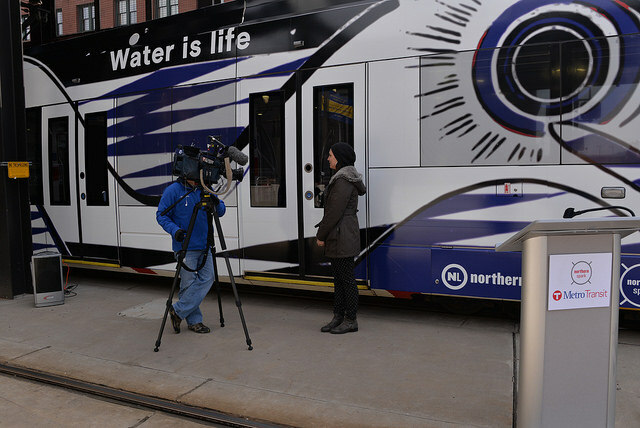 Carlson has taken as her theme a water panther on one side with the Dakota words Mni Wiconi (water is life). 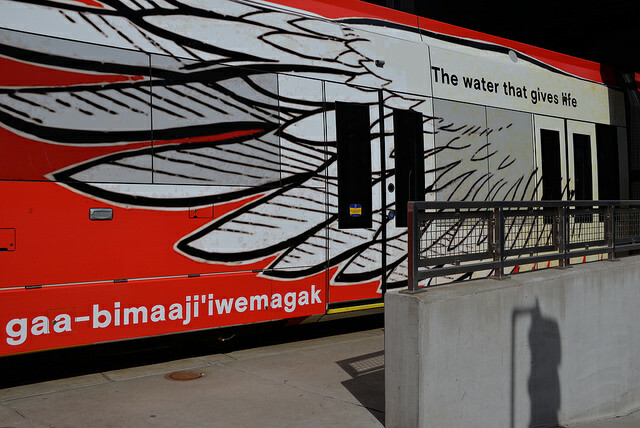 On the other side of the train is a thunderbird with the words Nibi gaa-bimaaji’iwemagak (water gives life) in Ojibwe. Historically trains have been problematic agents of colonization in North America. In the age of Westward expansion, trains brought settlers who brought with them environmentally hazardous agriculture techniques, deforestation and pushed many animal species to extinction. 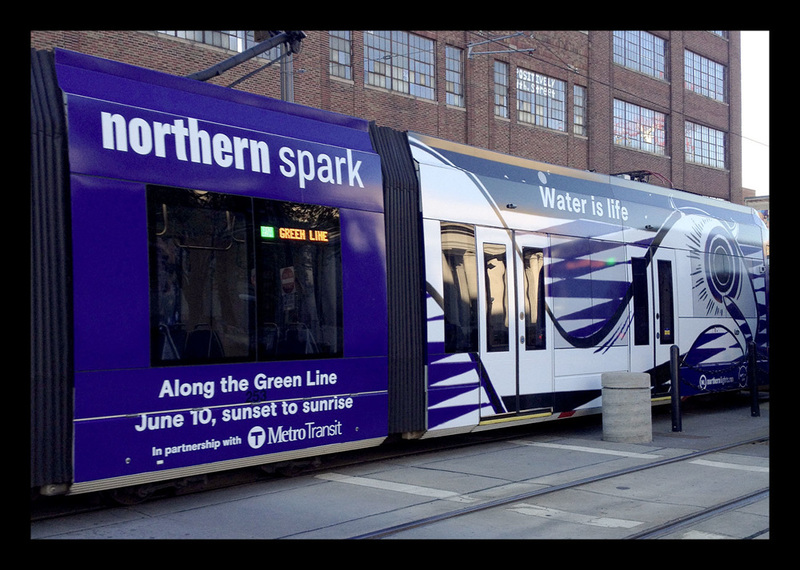 In an ironic context of this history, light rail has surfaced as an environmentally responsible option over cars. 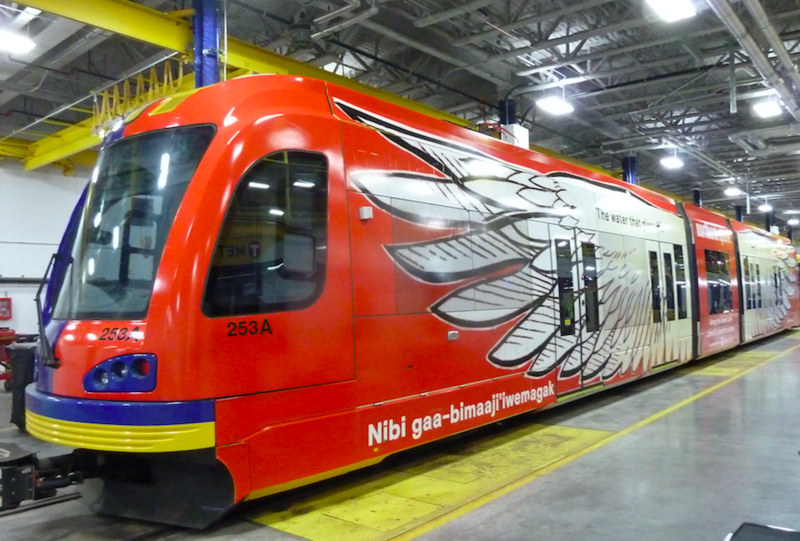 Because of this ironic history, because this train is on Indigenous Dakota land, and because this train crosses over so many streets named after historic military figures, I jumped at the opportunity to design a train that included the language of my Anishinaabe ancestors. 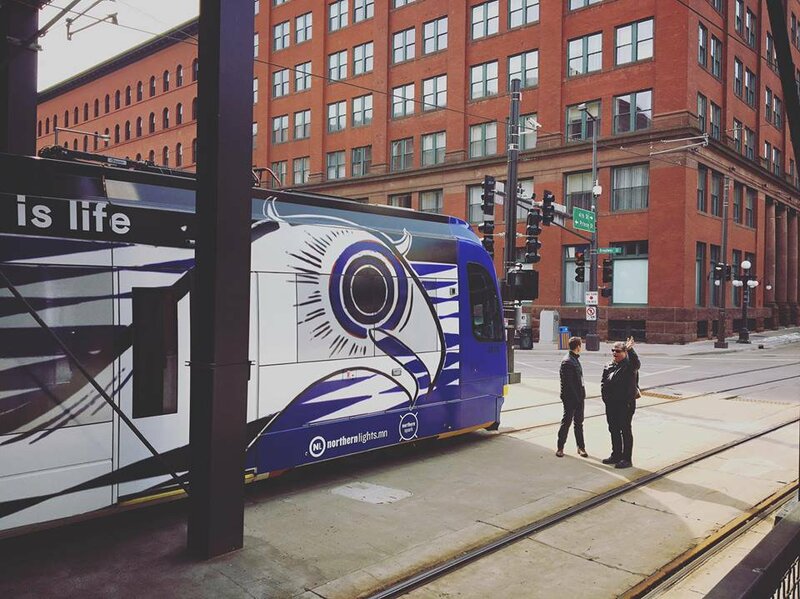 Indigenous languages revitalization in the Twin Cities is happening not far off of the Green Line and throughout Minnesota. I learned to speak Anishinaabemowin (the Ojibwe language) at the University of Minnesota. While I was a student, back in 2000-2003, I remember a fellow student lamenting that we didn’t see Indigenous languages in our environments. The student mentioned seeing other languages and translations on government advertisements on buses. When I was approached to design the train, I thought about this student. With Indigenous language acquisition comes a worldview that challenges our alienation from the environment. Environmentalism is baked into our languages and philosophies. For Anishinaabemowin, it is contained in the etymology of words and root concepts. For those of us who are struggling to decolonize our minds seeing a message that implicates everyone in such a visible, public and undeniable way is a point of pride and affirmation. I am so proud of the Dakota phrase mni wiconi. Our bodies are mostly water. The surface of the earth is mostly water in ratio not unlike that of the human body. Elders will often say that water is the blood of the Earth. We are connected to every living thing through water that moves between us and the Earth. The statement “water is life” is a truth that everyone must cherish, we are made up of this ancient material and our survival depends on us taking it into the future. The red and blue color choices are taken from the Big Drum design. These drums have many variations, but usually have a line down the middle with red and blue on either side. In Anishinaabe worldview, the coming together of perceived opposites is a powerful gesture and the design might refer to dawn, dusk, the horizon line and other liminal spaces. But I am more interested in the origin of that drum and ceremony because it is a story of peacemaking and a bit of Minnesota history. Thomas Vennum, Jr. relates the story about the Dakota origin of the Big Drum, or “Sioux drum” (in Ojibwe: bwaani dewe’igan). The origin story breaks my heart. It is hard to imagine hiding in a lake for four days and emerging with a remedy for conflict. 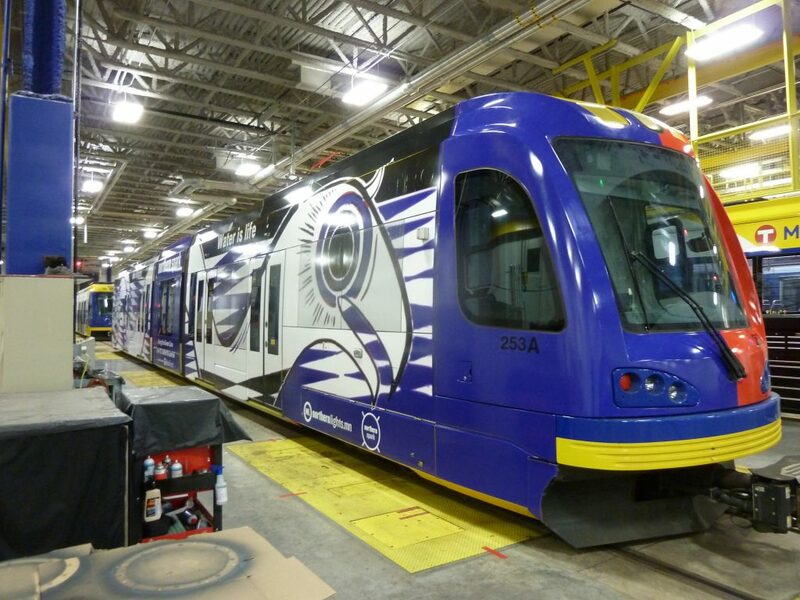 The train’s design cites another two-sided image of strength. The Thunderbird and Water Spirit image references a coming together of two opposing elements that appear to complement each other. In tradition woven bags these image converge bringing balance and healing. 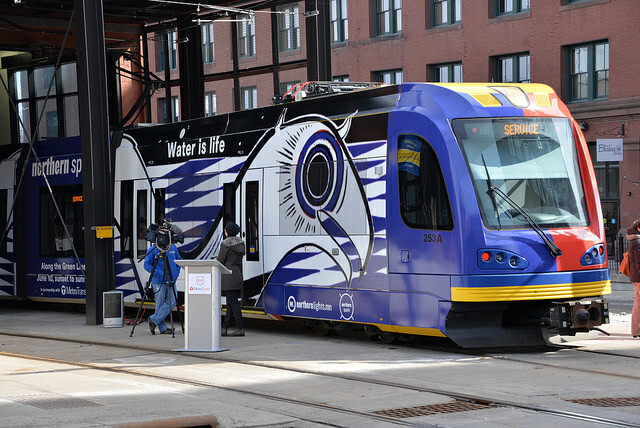 The Green Line train follows a section of University Avenue between Minneapolis and St Paul, it connects two sides, two tribes, the Dakota and Anishinaabe (Ojibwe). The train follows this avenue, a tributary. Roads are hard surfaces that don’t allow water to penetrate, which means that they are tributaries when it rains and when the snow melts. We must imagine the roads we travel as dry riverbeds, invented veins that connect us to each other. 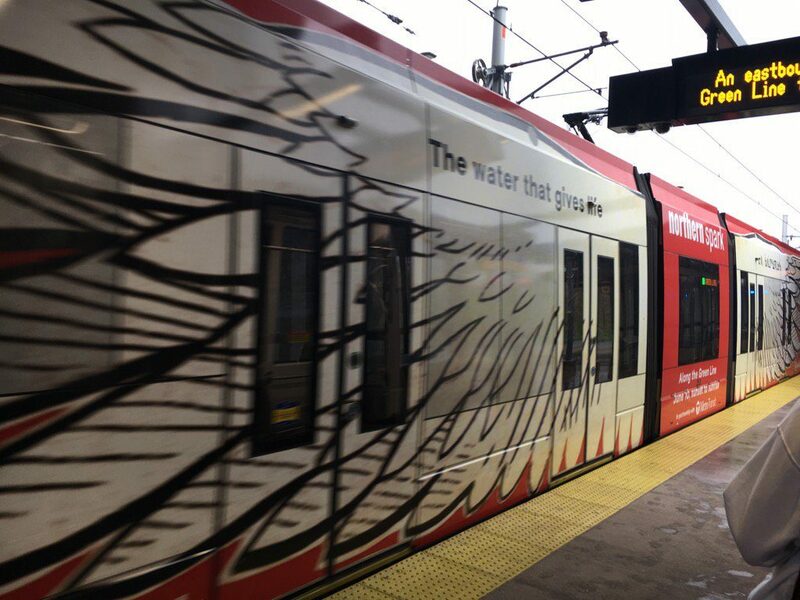 To read more about Andrea’s Train Wrap design, read her interview with Assistant Curator, Elle Thoni.